Does this DSLR have enough to tempt Four Thirds photographers? A 12.3 million pixel sensor borrowed from the E-PL1, a new TruePic V+ processing engine, 720p movie recording and an electronic level are all improvements that the Olympus E-5 has on the E-3, but is that enough to tempt Four Thirds photographers to buy an E-5? 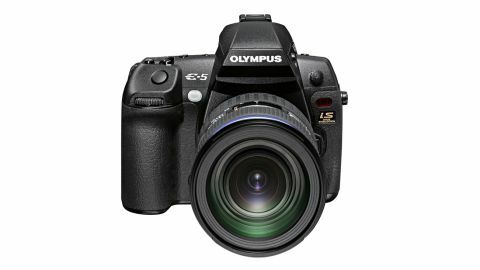 It's unusual for a camera manufacturer to announce a camera and say that it may be the last in the line, but that's just what Olympus has done with its E-5 release, the replacement for the E-3. With this Olympus E-5 news, the company isn't saying it will be the last top-end E-series camera, but it may be the last one with an optical viewfinder and reflex mirror. Olympus is also keen to point out that removing the mirror from DSLR doesn't have to result in a smaller camera; it could be done to create space for new, previously unthought of features. After all, the company has a history of developing features such as full-colour live view and articulated LCD screens for Olympus cameras that initially some thought gimmicky, but have now found favour and have been adopted more widely. So, having whetted our appetite for the future, Olympus gives us a relatively minor upgrade to the E-3, with a 12-million-pixel sensor instead of a 10-million-pixel device, a new processor, a larger LCD with a higher resolution, 720p movie recording capability, an electronic level and a switch to SD and CF slots instead of xD and CF ports. Again rather unusually, but with refreshing honesty, Olympus UK's Mark Thackara tells us that the company isn't really expecting to persuade many photographers to switch brands: the Olympus E-5 is intended to keep existing E-series users happy. But is there enough to keep them faithful to the brand, we wonder?